• The Philadelphia Phillies have hired former Toronto Blue Jays catcher Pat Borders to manage the Short-Season Class-A Williamsport Crosscutters for the 2015 season. The 1992 World Series MVP suited up for 17 big league campaigns, including parts of eight (1988 to 1994, 1999) with the Blue Jays. This will be Borders’ first professional managerial gig. He joins fellow ex-Jays backstop Ernie Whitt in the Phillies organization. Whitt is a roving catching instructor with the club. • The chances for North Delta, B.C. native Jeff Francis to make the Blue Jays big league staff took a hit on Wednesday when he surrendered four earned runs in 2/3 of an inning against the Tampa Bay Rays in the Jays’ 9-3 loss. Prior to that appearance, the Canadian southpaw had struck out four in three scoreless innings. Francis rebounded to contribute a scoreless inning in the Jays’ 6-3 win over the Phillies on Saturday. The 34-year-old Canuck appears to be in a battle with Colt Hynes for the role of third left-hander out of the bullpen. Hynes, who last pitched in the big leagues for the San Diego Padres in 2013, hasn’t allowed a run and has surrendered just one hit in 5-2/3 innings this spring. • Three former Blue Jays relievers might be in the Los Angeles Dodgers bullpen this season. Right-handers Brandon League, Dustin McGowan and Sergio Santos will all likely pitch for the Dodgers at some point in 2015. League was shutdown on March 15 with soreness in his throwing shoulder. Also vying for a spot on the Dodgers’ staff is Canadian lefty Erik Bedard (Navan, Ont.). • Calgary, Alta., native Jim Henderson was re-assigned to the Milwaukee Brewers minor league camp on Thursday. However, on Saturday, the club rescinded the decision and instead decided to place him on the disabled list. The 6-foot-5 right-hander, who saved 28 games for the Brewers in 2013, is attempting to come back from shoulder surgery and has seen his velocity dip between five-to-10 miles per hour this spring. The Brewers’ strength and conditioning staff will work with Henderson to attempt to regain some of his velocity. • According to SB Nation’s Chris Cotillo and Mat Eddy of Baseball America, Brendan Harris, who played 20 games with the Montreal Expos in 2004, has signed a minor league deal with the Detroit Tigers. The 34-year-old utility infielder has hit .256 in parts of eight major league seasons with the Cubs, Expos, Nationals Reds, Rays, Twins and Angels. He spent last season with the Dodgers’ Triple-A affiliate in Albuquerque. By my count, there are now six former Expos – including Harris – left that could see big league action in 2015. The others are Bruce Chen (Cleveland Indians), Scott Downs (Cleveland Indians), Bartolo Colon (New York Mets), Maicer Izturis (Toronto Blue Jays) and Endy Chavez (Seattle Mariners). • This week’s trivia question: Only sixteen players have clubbed four home runs in one major league game. Soon-to-be Canadian Baseball Hall of Famer Carlos Delgado became the first and only player to do this in a Toronto Blue Jays uniform when he belted four homers on September 25, 2003 against the Tampa Bay Rays at the Rogers Centre. 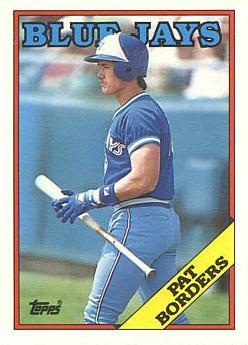 There are two other players, however, that once suited up for the Jays that later socked four home runs in a game with another team. Can you name them? Please provide your answers in the “Comments” section below. The winner will receive 1983 Topps Paul Molitor and George Brett cards. Great stuff Kevin, that’s a shame about Quantrill, hopefully he recovers and comes back the same pitcher. Thanks for the comment, Brent. Hi Len. You are correct. Thanks for participating. I think I might have your mailing information on file, but can you send me an email message to kevin.glew@sympatico.ca to confirm your address. Thanks. Wow. poor Quantrill. Too bad. Good kid. Hard hittin’ mark whiten! Awesome nickname. Watch the Dodgers bullpen dominate. How crazy would that be? They all have lively arms. Thanks for the comment, Devon. Yes, they have the potential to be very good.